Value of secant modulus of soil Es depends on pile diameter d and depth of an individual layers of the soil hi. The values of this modulus should be determined experimentally from pile-load tests. For cohesionless soils its value also depends on the index of relative density Id, for cohesive soils this value depends on the index of consistency Ic. Value of secant modulus of soil Es increases with depth. Values of secant modules Esi for various types of soils and different pile diameters and depths of piles are shown in the following tables . Intermediate values of secant modulus of soil Es can be interpolated linearly. The dialog window for entering the secant modulus Es can be displayed in the frame "Settlement" using the "Edit Es" button. 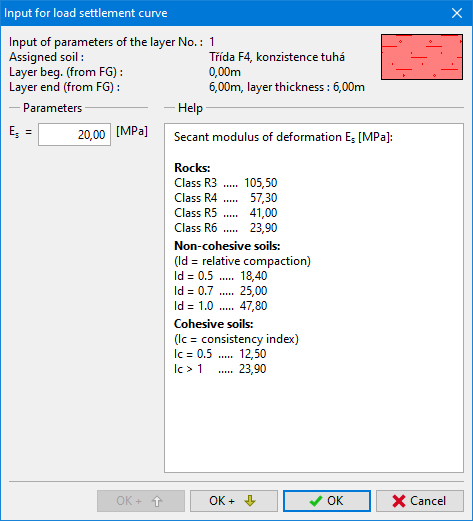 When editing the dialog window displays the recommended values of the secant modulus of soil Es according to the pile diameter d and depth of center of soil layers hi. CSN 73 1002: Pilotove zaklady. Praha, UNM, 1988, 28 p.
 CSN 73 1004: Velkoprumerove piloty. Praha, UNM, 1981, 56 p.
 Masopust, J., Glisnikova, V.: Zakladani staveb Modul M01. 1st edition, Brno, AN CERM, 2007, 182 p., ISBN 978-80-7204-538-9. Pochman, R., Simek, J.: Pilotove zaklady - Komentar k CSN 73 1002. 1st edition, Prague, Vydavatelstvi norem, 1989, 80 p.